Looking for something new this Valentine’s Day to share in the classroom? Here’s a no-bake option that takes stuffed strawberries to a whole new level. 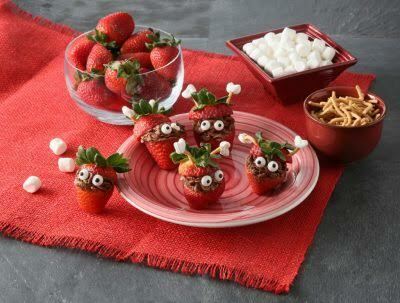 With the right filling, some crunchy Chinese noodles, mini marshmallows and a few other delicious additions, you can turn plain strawberries into adorable Valentine critters to share. Insert the marshmallow heart into one end of the Chinese noodle. Depending on the length of the Chinese noodles, you may want to break them in half to create the antennas. Insert the other end into the top of the strawberry you have set aside. Repeat to add two antennas per stuffed strawberry. Using a piping utensil, fill the strawberry and continue generously over the top so that you can add two candy eyes and complete the stuffed strawberries with the top that holds the antennas. *Candy eyes can be found at your local craft store.